Rejs med tog gennem den smukke natur på Peloponnes i en heldagstur fra Athen til Meteora-klostrene. Din chauffør vil møde i byen Kalambaka og tage dig til det middelalderlige klosterkompleks, der ligger højt oppe på toppen af sandstensklipper og er en del UNESCOs verdenskulturarv. Det er en dejlig måde at opleve en af Grækenlands mest betagende og mere ukendte kulturskatte. The view from the mountain top is breathtaking. However the train was delayed for 2 hours. We took almost 7 hours train to get there , and only has one and half hour to visit. Also, due to weather conditions, all the monasteries were closed, we can’t go inside to visit. We were a little disappointed by this . That is the main reason that I gave 3 stars. Otherwise the view and the monasteries from the mountain should worth 4 stars for this . So it is better to do this trip in summer, and if time permits, should stay overnight there. Worth every minute despite very long train ride. A class tickets are must have. Local guide and driver Dimitris and Yanis were very friendly and knowledgeable. Recommend taking metro after returning to Athens. Cab drivers ar train station are complete rip off and become very agitated when you try to bring price down. Food on the train is meh and really no time to buy at Kalamaka. Take something lite with you. It’s a long trip but we’ll worth it. If you have the time, I recommend going up one day, staying in a hotel and returning the next. A bad start - No Seat Ticket allocation provided tour company - and I was not listed on the passenger list. Left standing on the train for first 40 mins. Very stressful. Only on arrival in Kalambaka and finding my Name presented by the Tour Guide there did I have confidence of this booking. Seating problems were the same on the return train trip. Having said that - the Meteora experience is wonderful. The guide and bus driver were fantastic. This beautiful and other worldly destination is a must if one has the time when in Greece. This was a wonderful private trip. The trains were very slow but that is expected, but everything else was wonderful. Simply an amazing tour. It's probably out of their control but wish we could have stopped in more of the monasteries. Very intelligent tour guide who unswerving on many questions and went above and beyond just a tour. breathtaking views! very doing trip on the train 5 hours each way - truly worth of effort! The few hours in Meteora were well worth this trip! We had Ilias as our guide. He was very timely and courteous and it was like our own private car. He stopped at the best sites for us to take photos and answered all of our questions. You can tell how much he loves his town and is proud of it. He even stayed with us for dinner and walked us right to the train door for our trip back to Athens. We saw two monasteries and stopped at plenty of other great viewing spots along the way. 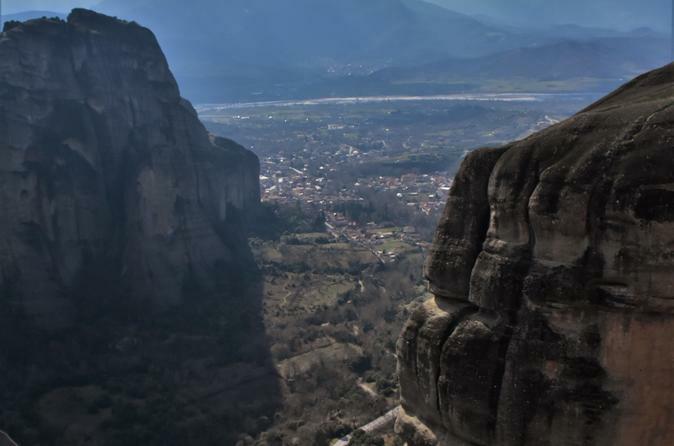 If you only have one day to visit Meteora you won't be disappointed. I highly recommend this trip. The train ride from Athens was fairly long 5-6 hours each way, but still well worth it for the quality of the sights. Our tour guide was highly knowledgeable and the bus driver was an expert at helping participants get the best photos possible of the amazing landscapes. 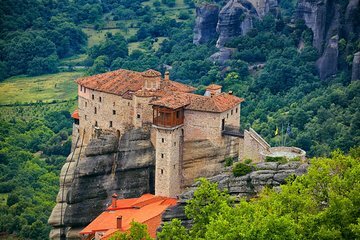 The Meteora area is a stunning area to visit. I had to rate the trip with 3 stars primarily because of the disorganization of the trip. You travel solo the first 5 hours of the trip. The issue I ran into was that the company did not send me in advanced the electronic ticket nor instructions on how to get them. I called them the day of the trip when they opened and they told me someone at the train station would give me paper tickets. That did not happen. At the last minute someone showed up and made me run to the train it was about to pull out. I ended up having to purchase the ticket on the train and wound up moving multiple times because I did not have a reserved seat. The taxi tour guide in the Meteora area was very good gave a good tour. Others that did the trip also experienced the same problem no electronic ticket or instructions provided but at least they found the person at the train station with the tickets - which they complained did not have anything showing the name of the company running the tour asked him because he had a clipboard. If I hadn't had the confusing incident at the start of the trip, I would give it a 5 star I have substracted 2 stars because of the organization at the start of the trip.